Abdul al-Aziz Rantissi - Who is Abdul al-Aziz Rantissi? Co-founder and principal spokesman of Hamas. Became Hamas' leader in the Gaza Strip on the assassination of Ahmad Yassin, 22 March 2004. Married with six children; his base is the Shaykh Radwan area of Gaza City. Rantisi was born October 1947 in Yibna, a small town between al-Majdal and Jaffa. When he was 6 months old, the family were made refugees from the 1948 war. They fled to Gaza , expecting to return at war's end. Settled in Khan Younis Refugee Camp (second largest refugee camp in the Gaza Strip, at that time under Egyptian rule), where their neighbors were the family of Mohammed Dahlan. Grew up in extreme poverty, lived with parents, 8 brothers and 2 sisters in a tent for four years, then in an abandoned school building, before moving into an UNRWA mud house. Started working at age 6 to supplement father's income. An uncle was killed when Israel shelled Khan Younis Refugee Camp in the Suez crisis of October 1956. Rantisi attended the UNRWA secondary school in Khan Younis. Graduated top of his class in 1965. Egypt at that time offered university education to exceptional Gaza students who were too poor to pay tuition, and Rantisi began studying pediatric medecine at the University of Alexandria that fall. Professed no political or religious interests at that time, his main interest was in becoming a doctor. At Alexandria, he ran into a familiar face, Sheikh Mahmoud Eid, who had been imam of the mosque in Khan Younis when Rantisi was a child. Eid introduced him to the Muslim Brotherhood. Eid introduced him to the works of two Islamic scholars, Sheikh Hassan Banna, who founded the Muslim Brotherhood in Egypt in 1929 and was its "Supreme Guide" until he was murdered 20 years later, and Sayyid Qutb, a theoretician and writer who was hanged in 1966 for allegedly plotting to assassinate Nasser. Rantisi completed his degree and returned to Gaza in 1972, founded the Gaza Islamic Centre in 1973. The Strip was by this time under Israeli occupation, its refugees camps provided thousands of recruits for Fatah and the PFLP, and anarchy ruled on the streets, with PLO activists targeting Israeli soldiers and local Palestinian collaborators. In 1974 he returned to Alexandria for his two-years Masters in Pediatrics. He formally joined the Muslim Brotherhood on his return to Gaza in 1976. At that time he took up an internship at Nasser Hospital, the main medical facility in Khan Younis Refugee Camp. He was dismissed as head of Pediatrics there by the Israelis in 1983. He also joined the Faculty of Science at the Islamic University of Gaza, on its opening in 1978, teaching science, genetics and parasitology there. The Camp David Accord of 1978 left the Palestinians under Israeli occupation with a toothless automony. Sadat sealed the Egypt/Gaza border, where there had previously been free passage, cutting Gazans off from higher education and employment. In Egypt, the Muslim Brotherhood opposed the Accords, and Sadat expelled those who were known troublemakers into the sealed-off Gaza Strip. A number of them approached the Israeli administration there in 1978 for licenses to open a jama'ah (Islamic association), to build kindergartens, improve literacy, open stores. The movement began to flourish and branched out into building mosques. Chief architect of the Islamic revival was Sheikh Ahmad Ismail Yassin, a Muslim scholar who did not disguise his belief that Israel was an illegitimate state, but urged his followers not to rush into a jihad before they could win. Instead he urged them to pursue (tarbiyeh) education and (da'wah) preaching. So when he approached the Israeli authorities, as the supreme leader of the Muslim Brotherhood in Gaza, to register charitable organizations to propagate Islam and to recruit supporters for the faith, the Israelis provided the appropriate tax-free licences. A series of Islamic societies was licensed in the Gaza Strip and the West Bank, the most important of which was Yassin's "Islamic Assembly" in Gaza, which had 2,000 members and effectively controlled Gaza's mosques. Within a decade, Yassin built the assembly into a powerful religious, economic and social institution in the Gaza Strip. He developed a welfare network around the mosques, many of which served also as community centres. The number of mosques in the Gaza Strip tripled from 200 to 600 between 1967 and 1987, while the number of worshippers doubled. In the West Bank, the number of mosques went from 400 to 750 in the same period. With the Egyptian border sealed, only route out of the Occupied Palestinian Territories after 1967 was via the West Bank and the Abdullah Bridge into Jordan. The Muslim Brotherhood increasingly came into contact with, and under the influence of, Jordan instead of Egypt. They were courted by King Hussein because they were a counterbalance to the PLO. The Brotherhood used the money that flowed in from (primarily) Saudi Arabia and now the Jordanian monarchy to build up its network of mosques, cultural organisations and welfare services that were to provide a lifeline to the impoverished Palestinians. In 1984, Israelis discovered the largest cache of weapons yet uncovered in the Palestinian Territories, in the hands of the Muslim Brotherhood. The weapons had been bought on the Israeli black market. The interesting thing from the Israeli perspective was that they had been in the Brotherhood's hands for over a year and not used. The entire Muslim Brotherhood leadership was jailed for lengthy terms, Yassin got 13 years. In Yassin's absence, Rantisi stepped up to organise the Muslim bloc in student council elections at the Islamic University, where they won 80% of the vote. In Spring 1986, he launched largely successful campaign to rid the university of the PLO supporters. In the mid 1980's the al-Jihad al-Islami (Palestinian Islamic Jihad) became active in a different direction. They were opposed the Muslim Brotherhood's priorities, i.e. Islamization of Palestinians before the national liberation struggle. They felt that the Brotherhood was wasting its time fighting for control among Palestinian factions, that the priority was the liberation struggle and that Islamists should follow the example of the PLO's armed resistance, and even coordinate with them. With the eruption of the first intifada erupted on 9 December 1987, it was apparent that quietist Islamization first, resistance second, was not a philosophy that appealed to the Palestinian street. On the first day of the intifada, Rantisi and six others (Yassin, 'Abdel Fattah Dukhan, Mohammed Shama', Dr. Ibrahim al-Yazour, Issa al-Najjar and Salah Shehadeh) established an offshoot of the Muslim Brotherhood to join in resisting the occupation. They named it The Islamic Resistance Movement (Harakat al Mukawwamah al Islamiyya), known by its acronym HAMAS, meaning "zeal". The intention in creating Hamas was to show that the Muslim Brotherhood was one of the initiators of the intifada. The Hamas covenant (i.e. founding charter), published in August 1988, was a blend of nationalism and religion. It called for an exclusively Islamic Palestinian state, repudiating the PLO's formulation of a democratic secular state as anti-Islamic, and made territorial nationalism into a religious mission or jihad. It called for the destruction of the state of Israel. The charter explicitly rejected direct confrontation with the PLO, but refused to recognise the "sole representative status" of the PLO, positioning itself instead as an alternative leadership of the Palestinian people. To this end, Hamas organised independently of the intifada's unified leadership, issued its own leaflets, and called separate strikes, often on holy days. Rantisi had been arrested in January 1988, accused of authoring Hamas' street pamphlets inciting support for the intifada. He was sentenced to 2 ½ years, which he served at Ansar III (Ketziot), Gaza Jail and Kfar Yonnah. He was released on 4 Sept 1990, and effectively led Hamas (with Zahhar) until rearrested for incitement in November 1990. He was sentenced to 12 more months, which he served at Ansar III, first in isolation with Yassin and subsequently in solitary. Released from jail, 12 December 1991. Joined Gaza Medical Association, February 1992. Represented Hamas in the July 1992 reconciliation accord that brought an end to intra-Palestinian infighting in the Gaza Strip. (Haider Abdel Shafi signed for the PLO). In December 1992, Hamas killed six Israeli soldiers in one week. Israel responded by expelling 416 alleged Islamists to Marj al-Zuhur in south Lebanon, including Rantisi who acted as spokesman for the deportees. On his return, Rantisi was rearrested by Israel (in December 1993) and held until April 1997. Relations between Hamas and the PLO deteriorated after the 1991 Gulf War. Hamas took an unequivocal stand against US/Soviet-sponsored peace negotiations and mounted several well-supported actions against the Madrid Conference, including shutting down Gaza with a three-day strike. Rantisi himself expressed doubt that the Oslo process would amount to anything, on the grounds that Israel would never allow through negotiations genuine Palestinian independence or statehood, only an autonomy that would perpetuate Israeli rule. He therefore opposed any negotiation with Israel. In 1994, Hamas allied with the Popular and Democratic Fronts to form the Damascus-based Palestinian Forces Alliance, an anti-Oslo coalition of 10 opposition groups. In 1993, it participated with these opposition groups in the Birzeit University student elections and defeated the pro-Oslo ticket. Hamas was divided over whether to participate in the first PA elections of January 1996. Sheikh Yassin supported participation because it would "reassert the strength of the Islamist presence", but other members argued that participation would legitimise Oslo. Hamas did not stand in the end, although some Islamists did stand and win independently. Hamas indicated that it would stand however in local elections, which probably explains why local government minister Saeb Erekat declined to organize them. In April 1998, Rantisi was arrested by the PA, after calling for the resignation of its leaders . He was held in custody without trial, for 20 months, accusing of involvement in the killing of Mohieddin Sharif. He was arrested again in July 2000, after calling the Palestinian participation in the Camp David talks an act of treason, but released in December 2000. Intermittently rearrested, e.g. April 2001, and in December 2001, when after public opposition the PA settled for holding him under house arrest. Rantisi opposed the June 2003 hudna (one of the Phase One Road map obligations), although Hamas eventually joined it under Yassin's influence. Rantisi subsequently defended the hudna as a means to prevent the US forcing the PA into a civil war with Hamas. On 10 June 2003, he survived an Israeli assassination attempt, which killed two bystanders and left 27 wounded (including one of Rantisi's sons, who was paralyzed). Rantisi himself was wounded by shrapnel in the chest and leg. Following the attempt on his life, and the assassination of the leading Hamas Ismail Abu Shanab, Rantisi opposed attempts to bring Hamas into a second hudna. And as recently as January 2004, he spoke against Hamas joining a new Egyptian-sponsored ceasefire. 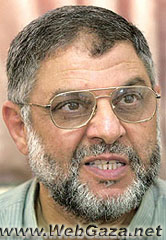 Rantisi was appointed head of Hamas in the Gaza Strip following the assassination of Ahmad Yassin on 22 March 2004. He knew that he was a marked man as soon as he took office, but declined to go underground and was philosophical about the prospect of assassination, It's death whether by killing or by cancer, it's the same thing." Rantisi was assassinated in an Israeli helicopter missile strike, as he returned from a clandestine visit to his family on 17 April 2004. In a statement, the Palestinian National Authority (PNA) called on Saturday the international community to move immediately to protect the Palestinian people and his leaders from the state terrorism practiced by Israel in order to “blow a deadly strike to the Palestinian people’s steadfastness and oblige it to surrender to the Israeli occupation, settlements and arrogance." The Palestinian Prime Minister Ahmed Qurei' said that Rantisi's assassination was a "direct result" of encouragement from the United States. "The Palestinian cabinet considers this terrorist Israeli campaign a direct result of American encouragement and the complete bias of the American administration towards the Israeli government," he said. Dr. Sa’eb Erekat, Minister of Negotiations Affairs, condemned the killing of the Hamas leader as "state terrorism". The Foreign Affairs Minister, Dr. Nabil Sha’th, also attributed the assassination of Rantisi to the forgiving American attitude toward Israel. "Israel has been given a free hand [by the United States] to continue its policy of destruction, of siege, of assassination," said lawmaker Hanan Ashrawi. UN Secretary-General Kofi Annan condemned Israel's killing of Hamas leader Abdel Aziz Al Rantisi on Saturday, saying the assassination could lead to more violence in the Middle East. Hundreds of thousands of citizens, including prominent political figures, participated in the funeral procession of Hamas leader, Dr. Abdel Aziz Al Rantisi, and two of his bodyguards. The body of the Hamas leader, who was extra-judicially executed yesterday night, was taken to the Al Omari Grand Mosque in the heart of Gaza City, where his body would be prayed on and sent to his final resting place. During the procession, which started from the leader's home at the Al Sheikh Redwan suburb, citizens chanted slogans demanding revenge to Al Rantisi's killing and condemning the continuous Israeli military aggressions against the Palestinian people, as billowing banners of the different factions appeared throughout the procession. The funeral procession witnessed also a massive attendance of representatives of national and Islamic factions, who expressed the unity of the Palestinian stance in the face of the Israeli conspiracies, asserting that the resistance would continue despite the Israeli strikes. Meanwhile, symbolic funerals have been made for Dr. Al Rantisi throughout the cities, towns and villages of the West Bank, protesting such a horrendous crime, as leaders called to a three-day general strike, in which all shops, universities, schools and institutions would close its doors in mourning for the killing of Hamas leader. Al Rantisi's car was pounded by an Israeli combat helicopter Saturday night, wounding him very seriously and instantly killing his two bodyguards. He was rushed to the local Al Shifa hospital, where he was pronounced dead shortly afterwards. The Islamic Resistance Movement (Hamas), named late at yesterday night secretly its new leader in Gaza Strip , following the extra-judicial execution of Dr. Abdulaziz Al-Rantisi by an Israeli combat helicopter. A statement issued by Hamas, confirmed that the movement named a replacement secretly after its Hamas' Damascus-based leader Khaled Mash’al , had instructed that, in light of heightened Israeli escalation against the movement’s operatives, the Gaza leadership to keep the identity of the new appointee secret.